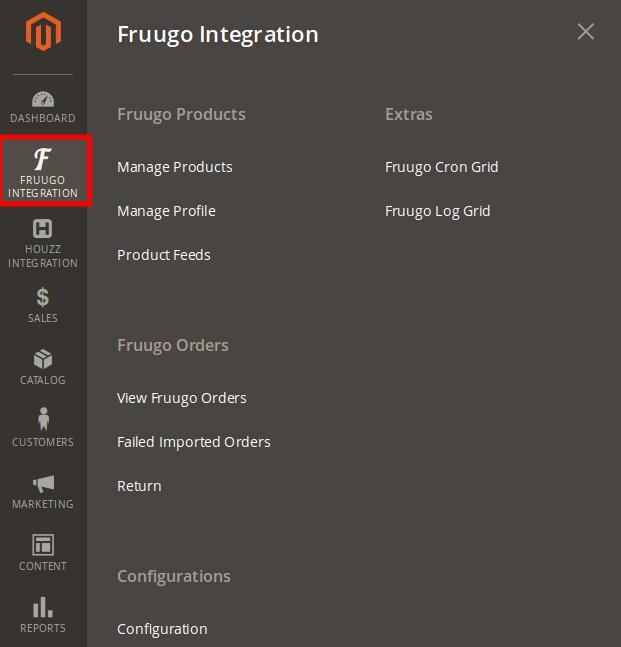 Once the extension is successfully installed in the Magento 2 store, the FRUUGO INTEGRATION menu appears on the left navigation bar of the Magento 2 Admin panel. The merchant has to first create a seller account in the Fruugo seller panel. 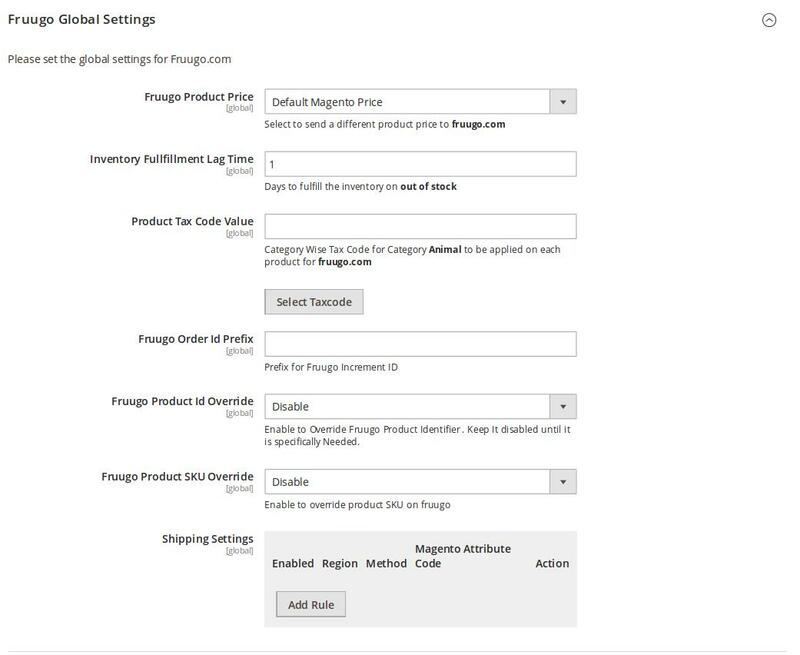 Once the seller account is created and is approved by Fruugo, then the Magento 2 store owner can use the Fruugo Username and Password while setting up the Fruugo Configuration settings in the Magento 2 Admin panel. On the left navigation bar, click the FRUUGO INTEGRATION menu. In the Api Url box, enter the required URL. In the User Name box, enter the Fruugo seller account Username. In the Password box, enter the Fruugo seller account Password. In the Debug Log list, select Yes to start Fruugo Integration in the debug mode. Scroll down to the Fruugo Product Sync Settings tab, and then click the tab. In the Select Store list, select the required store. Scroll down to the Fruugo Global Settings tab, and then click the tab. Increase by Fixed Price: If selected, then the Modify by Fix Price field appears. Increase by Fixed Percentage: If selected, then the Modify by Percentage Price field appears. Enter the numeric value to increase the price of the Fruugo, product price by the entered value % of Magento 2 price. Magento 2 price + 5% of Magento 2 price. Decrease by Fixed Price: If selected, then the Modify by Fix Price field appears. Decrease by Fixed Percentage: If selected, then the Modify by Percentage Price field appears. Magento 2 price – 5% of Magento 2 price. In the Inventory Fulfillment Lag Time box, enter the required value. Enter the numeric value for the fulfillment lag time provided with the number of days to fulfill the inventory when out of stock. In the Product Tax Code Value box, enter the 7 digit product tax code. Click the Select Taxcode button to select the required tax code. In the Fruugo Order ID Prefix box, enter the required prefix value. For instance, enter FG- for FG-10001. In the Fruugo Product Id Override list, select Enable to change the UPC/GTIN of any product previously uploaded on Fruugo if required. In the Fruugo Product SKU Override list, select Enable to change an SKU for an existing product on Fruugo if required. In the Shipping Settings area, click the Add Rule button. Scroll down to the Fruugo Inventory Rules tab, and then click the tab. In the Set Inventory on Basis of Threshold list, select Enable to send the inventory based on the threshold. Note: Only when the admin selects Enable, the other fields appear. Threshold Inventory is the minimum count of an item that the store owner wants to keep in stock. Scroll down to the Fruugo Cron Settings tab, and then click the tab. In the Fruugo Order Cron list, select Enable to enable the fetch order cron. In the Fruugo Price Cron list, select Enable to enable the Price Sync cron. In the Fruugo Inventory Cron list, select Enable to enable the Inventory Sync cron. In the Fruugo Shipment Cron list, select Enable to automatically generate the cron.